In the southern part of Lazio, about 120 kms from Rome, close to the border with Campania, is the Gulf of Gaeta; the coast, which has been flat and sandy for miles, suddenly starts to move, in a succession of promontories with little hidden bays and beaches and charming grottoes, alternating rich mediterranean vegetation and harsher, naked areas, all of it dipping down into a splendid sea with rich colours offering wonderful panoramas, with views stretching from Circeo, to the Pontine islands and as far as Ischia. The national park of the Riviera di Ulisse is here, in an area rich in historical remains and artistic treasures (it was to this area that the emporers and patricians of ancient Rome came for their holidays). Just a few kilometres from Gaeta, on one of these spectacular promontories - occupied on its lower point by the old tower called Torre Scissura built as a watchtower to spot the Saracen pirates in the 16th century - Villa Enea was built in the 1960s, and is a wonderful house with typical mediterranean colouring and structure. 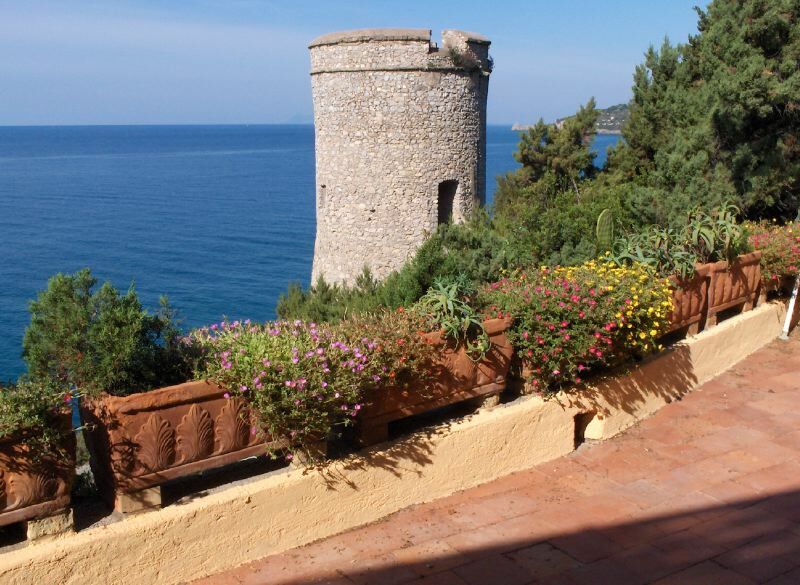 The villa is on several floors, and is surrounded by thick mediterranean vegetation, and looks onto the sea: from every angle and terrace your glance is filled with the colours of the sea and sky and captivated by the presence of the old tower. A stairway and path leads down from the house towards the tip of the promontory, where among the rocks of the cliff there are places where you can take the sun in peace and quiet and enter the water. 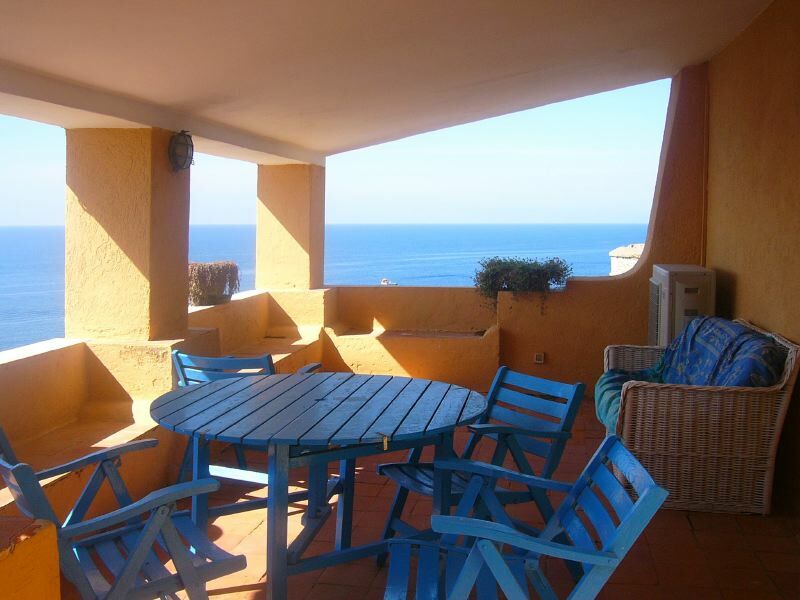 The house has 5 terraces, some of them covered, some of them furnished for sunbathing and has a patio with a table for dining outside; all of the terraces have excellent views. 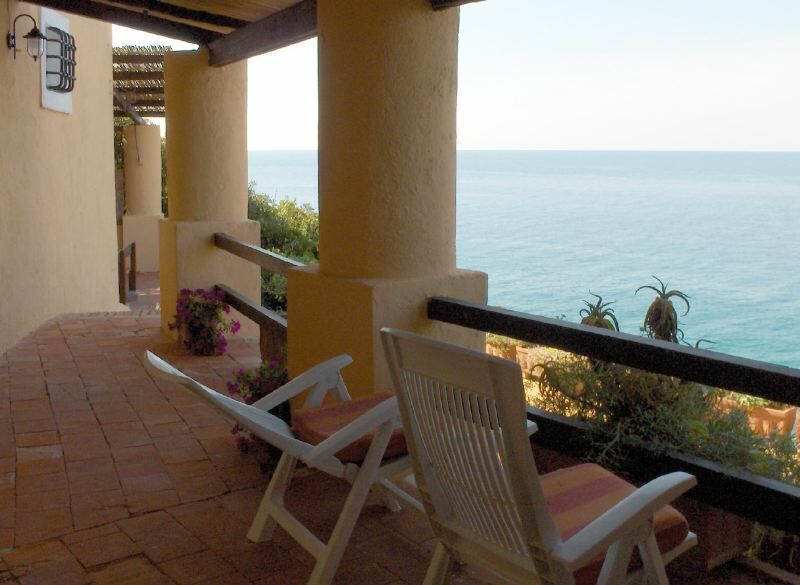 From all of the bedrooms you can enjoy the same splendid view of the sea and of the tower: the furnishings are simple, functional and pleasing, typical of seaside houses, with some antique pieces. The living-area on the ground floor is large and very comfortable, and some of the rooms have air-conditioning. The unique position of this wonderful house - it's like a ship anchored in its harbour - will give the sensation of being suspended between the sky and the sea throughout the day and can give you special moments to remember during the magic sunsets. Not far away on foot are some furnished sandy beaches; Gaeta, which is just 3 kms away, has a medieval town centre, a large castello and old town walls, and offers all the services you might need along with excellent restaurants. FIRST FLOOR: (arrival level) entrance, then on the right - 1 twin bedroom with panoramic view, 1 bedroom with bunk beds and panoramic balcony, 1 bathroom with hip bath, 1 double bedroom with panoramic terrace and air-conditioning and 1 bathroom with bath-tub; on the left - 1 small double bedroom with air-conditioning, 1 bathroom with shower. GROUND FLOOR: large double living-room with fireplace, TV and DVD player, air-conditioning and dining area and access to a panoramic sun-bathing terrace, veranda with access to a terraced area with benches, kitchen with oven, washing-machine and dishwasher and access to the panoramic terrace with table for dining outside, 1 WC with washbasin. SECOND FLOOR (with access from external staircase): small double bedroom with WC with washbasin and access to the panoramic sunbathing terrace with external shower.